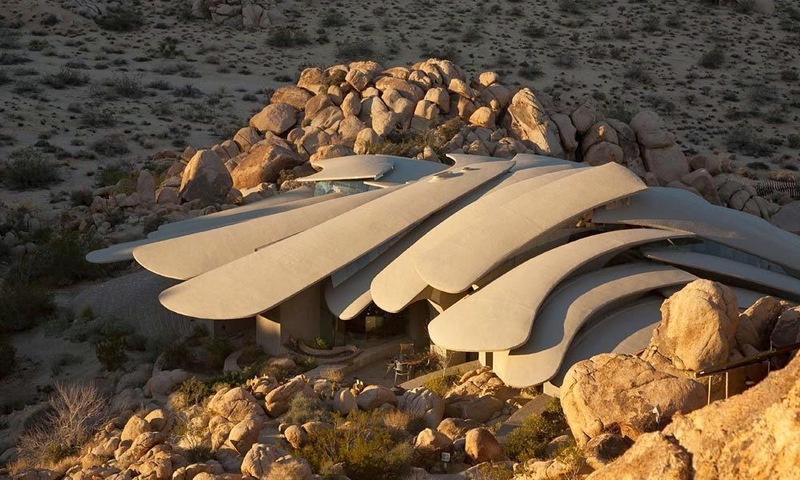 You most likely don’t know this but I’m a very big bond fan, a supremely huge bond fan. 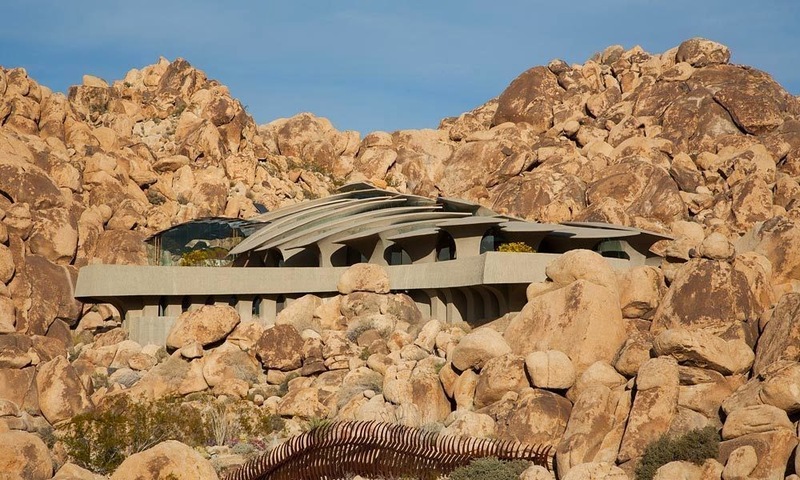 I own a copy of and have seen each of the 23 bond movies multiple times and one thing I’ve always loved about the vintage versions, before the more recent, reality based iterations is the gadgets and the Lairs of the infamous Bond Villains. 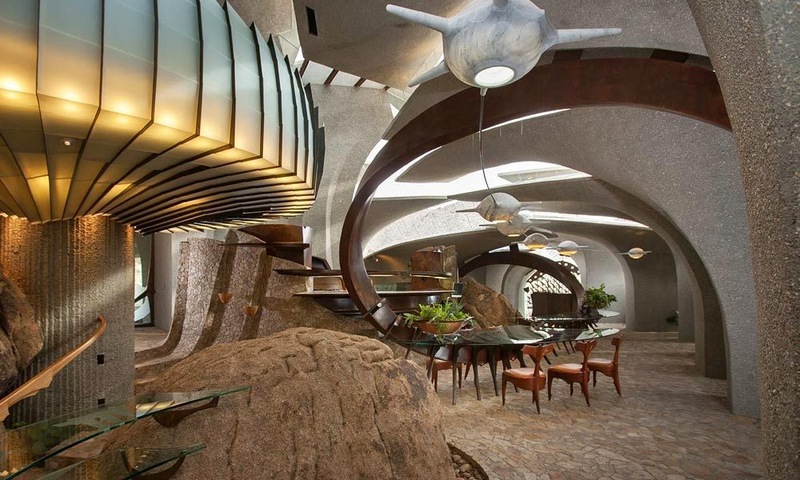 From islands, to volcanoes to space stations to amphibious underwater magnificence, I’ve always been intrigued by them from a design stand point and for the sheer audacity of scope. 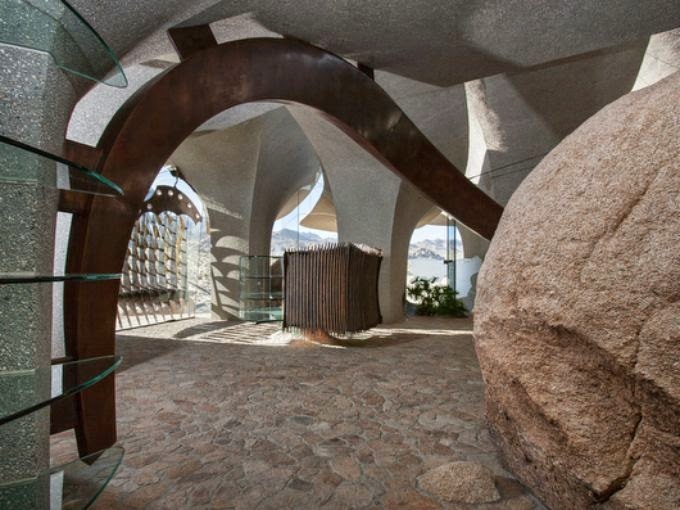 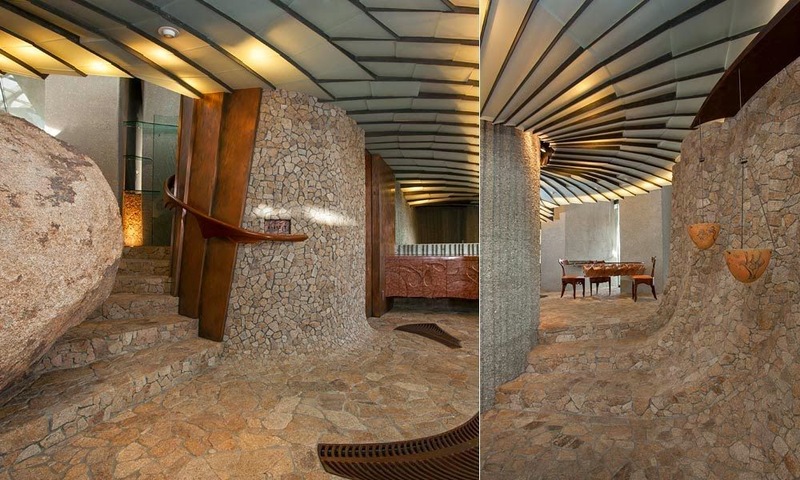 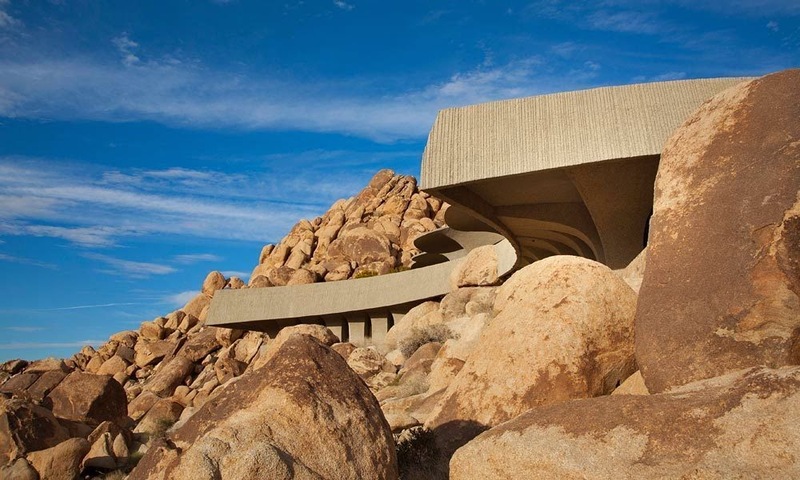 To this end, I’d like to introduce a project that can go toe to toe with the best of ‘Bond-Villain’ dwellings. 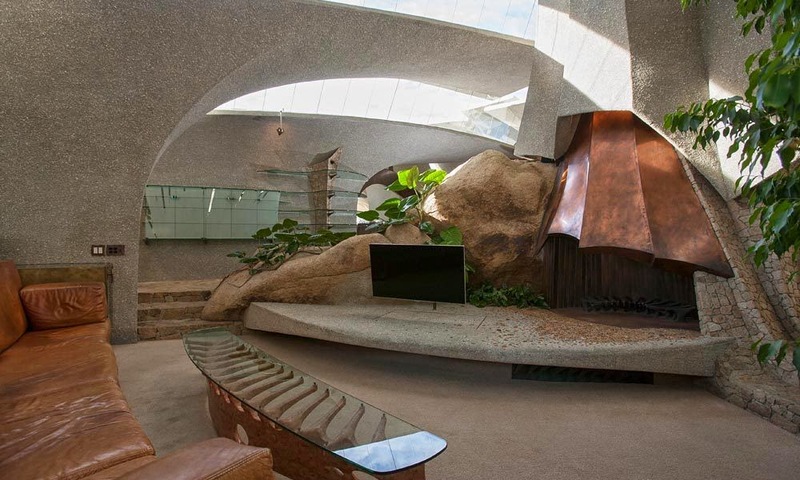 May I present the ORGANIC MODERN ESTATE. 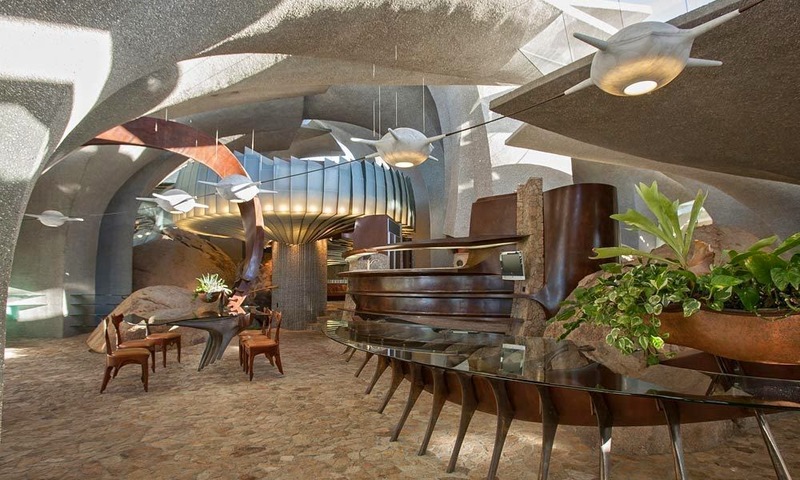 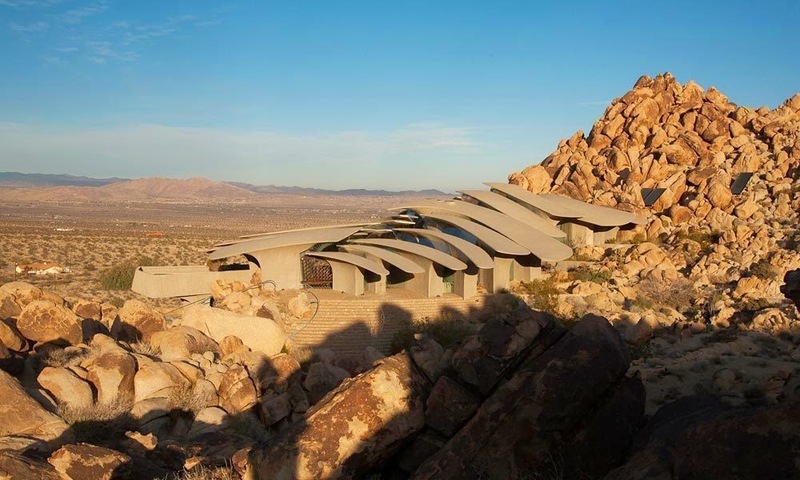 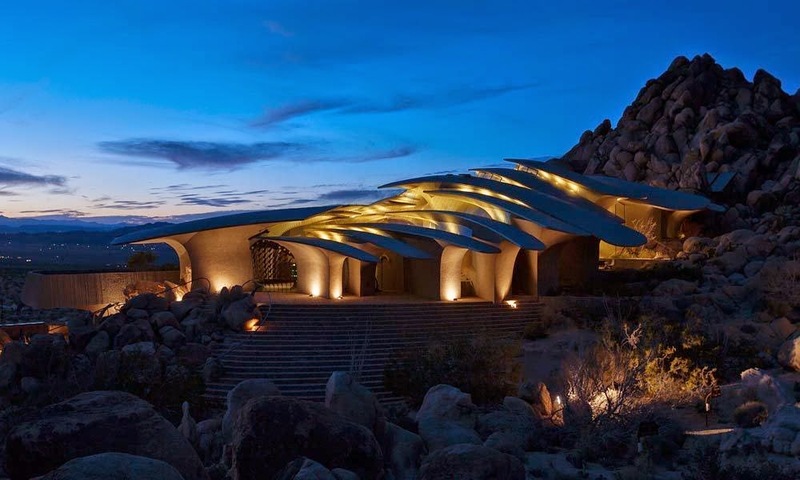 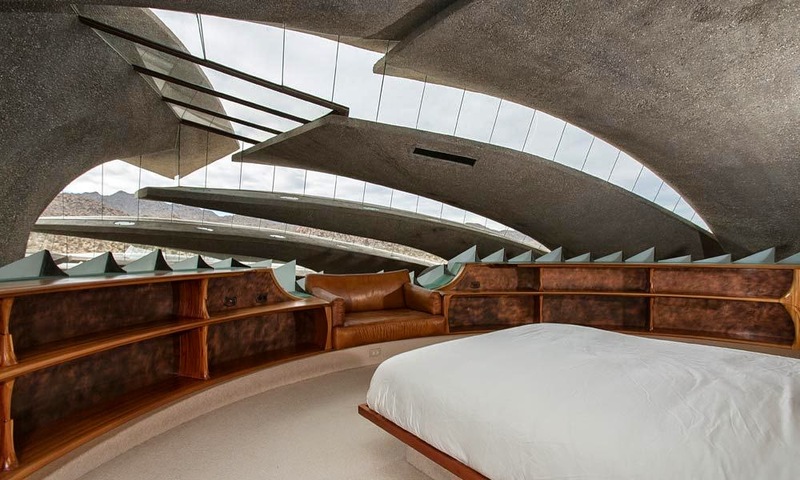 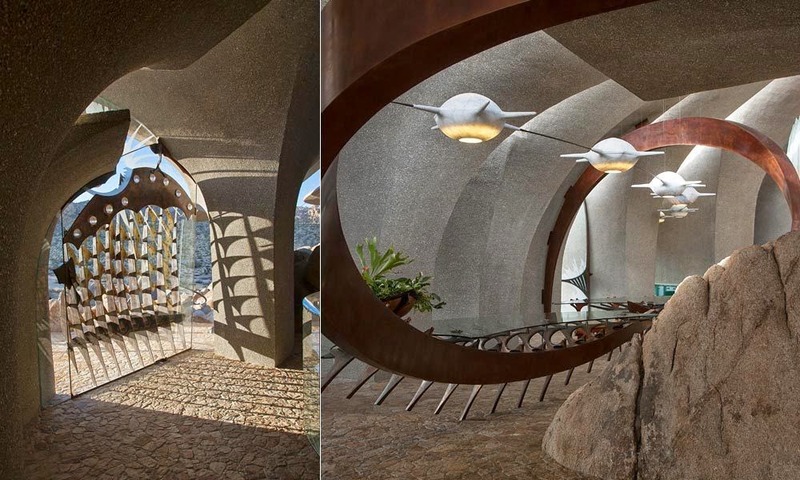 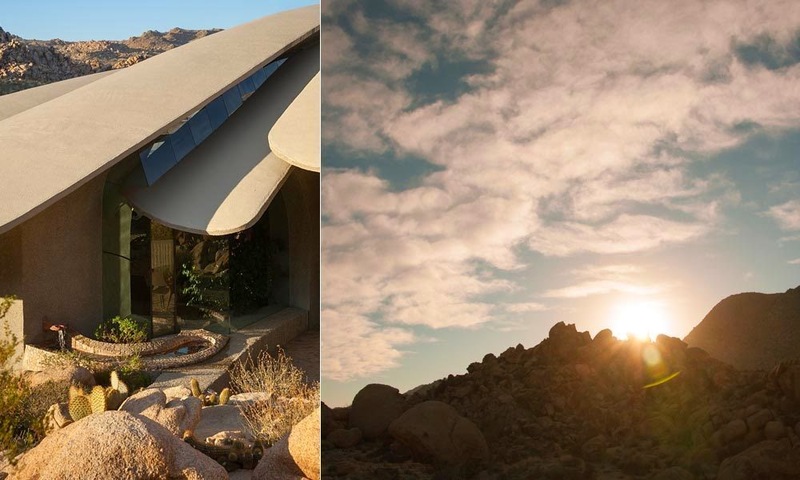 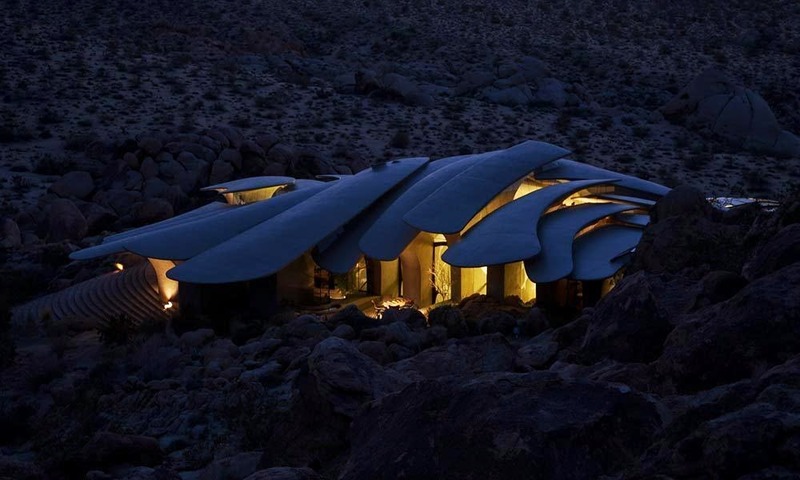 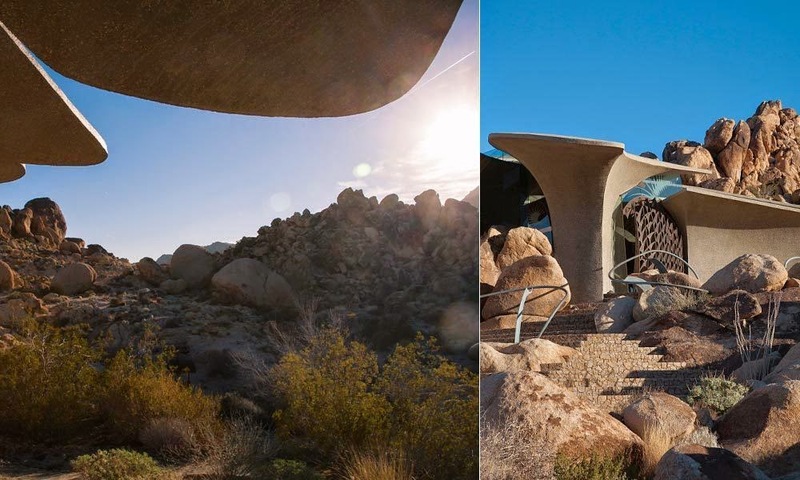 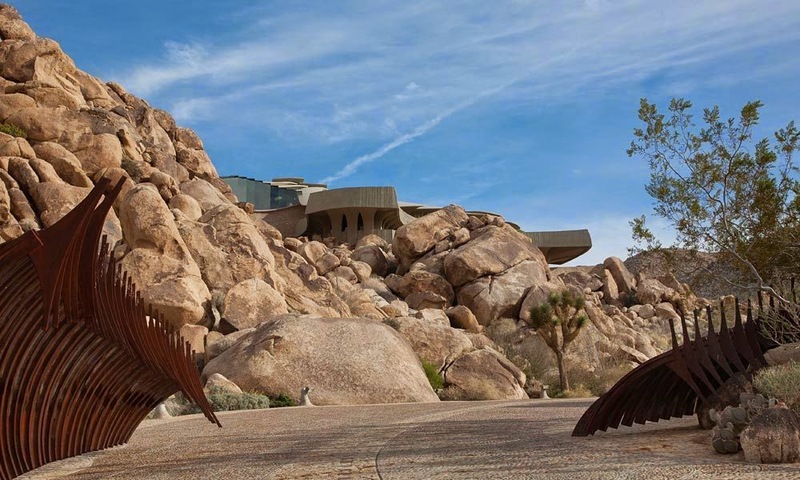 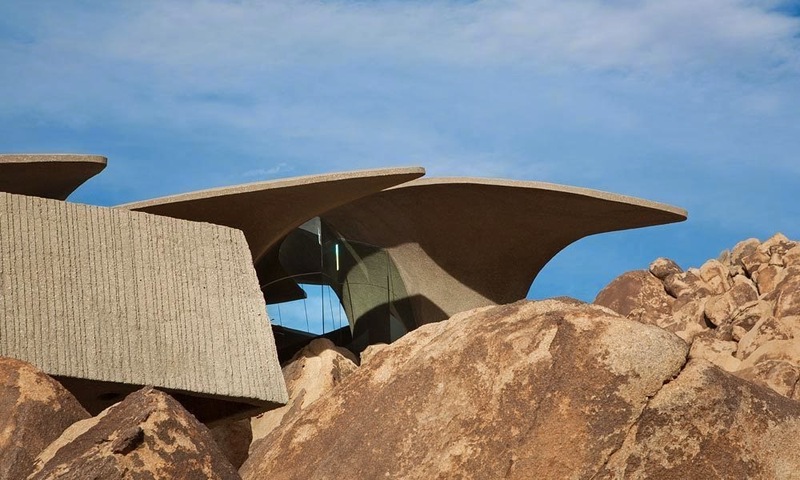 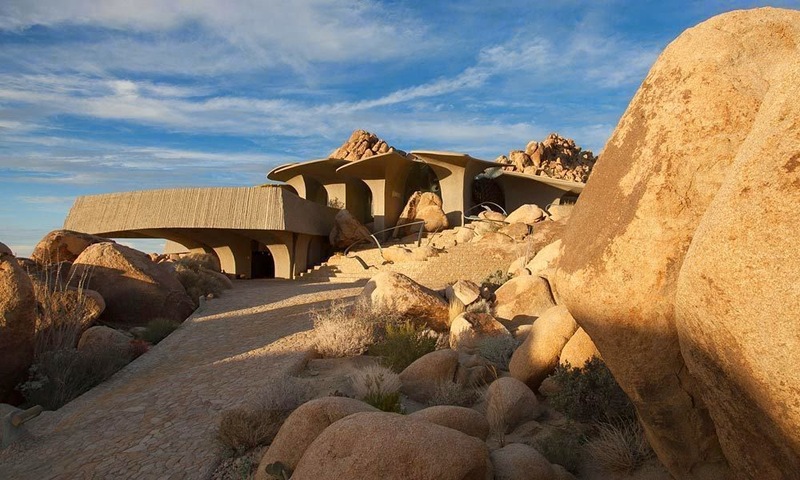 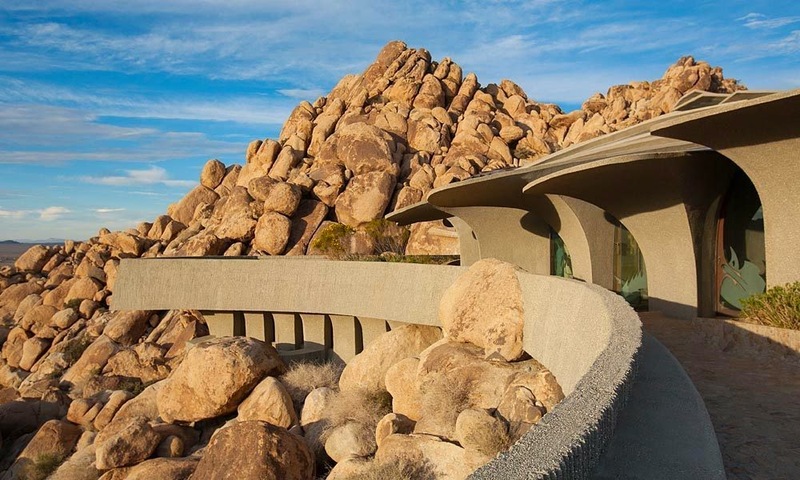 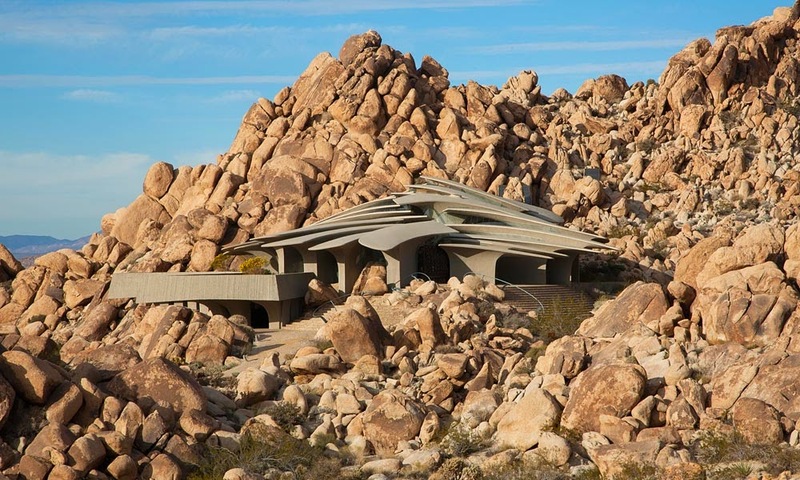 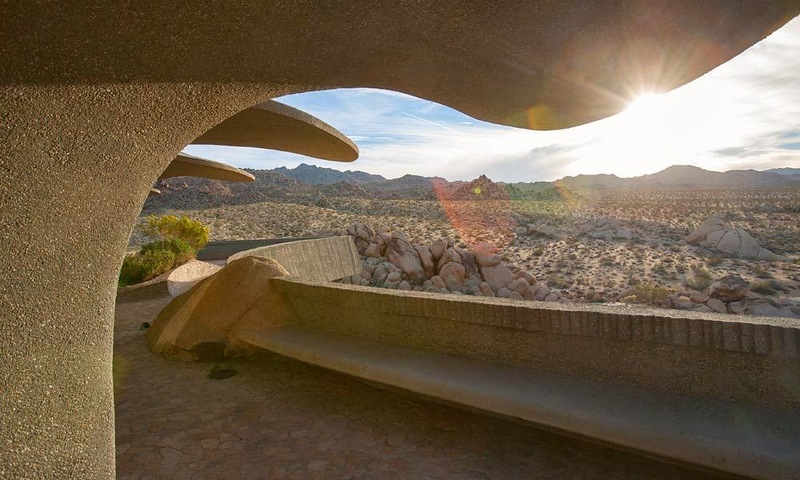 Located in Joshua Tree, California, the Home (or Lair) is a geometrically astounding piece of architecture secluded on 10 acres of desert embedded in a rock formation. 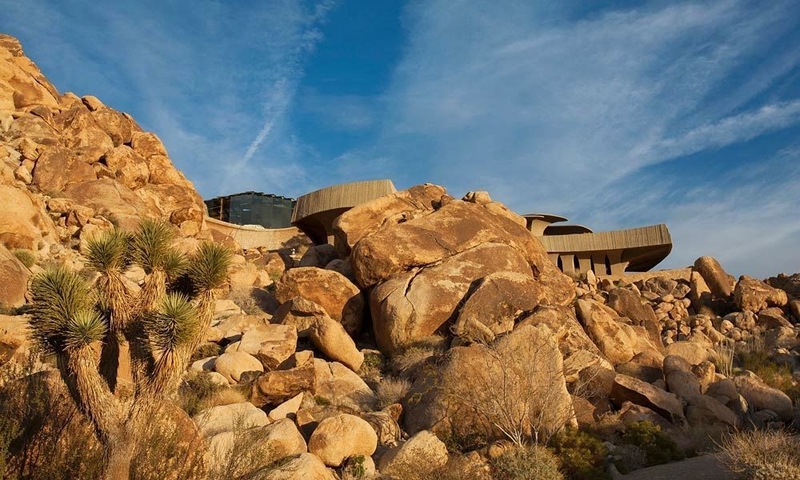 It has been called “the most important architectural house you may have never seen” flying under the mainstream radar for way too long. 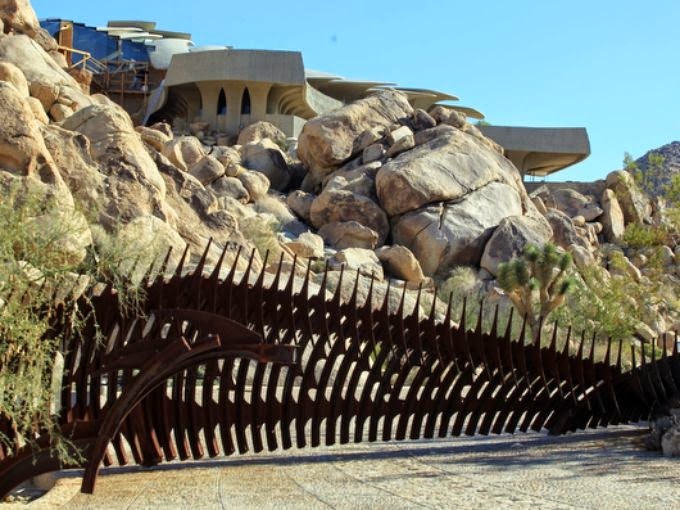 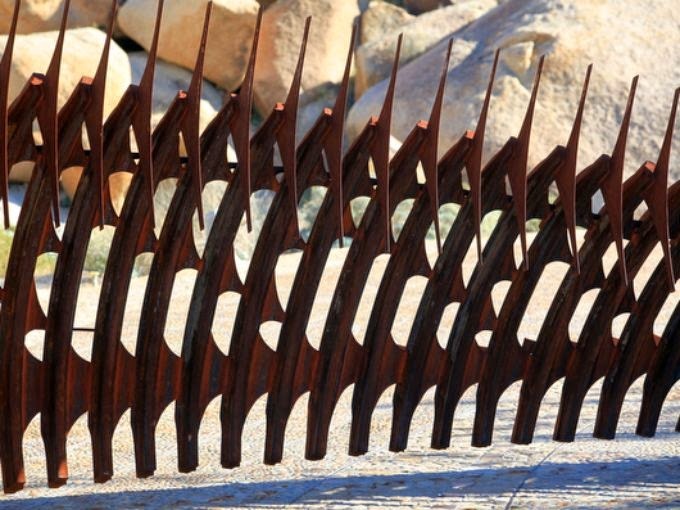 Designed as far back as 1988 by Organic Architect, Kendrick Kellogg, the building is made up of Concrete, Steel, Glass and Copper and carries a certain ‘skeletal’ or ‘ribbed’ theme through the entirety of the design even bearing a striking semblance to a rib cage when viewed from above. 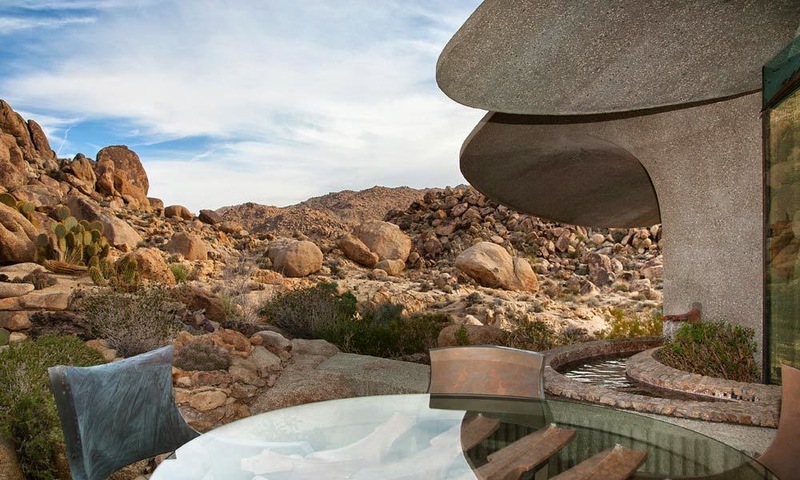 The beauty of this bespoke 3 bedroom bravery is the fact that it doesn’t just sit on the rocks within the site, it is OF the rocks, integrally designed as part of the site. 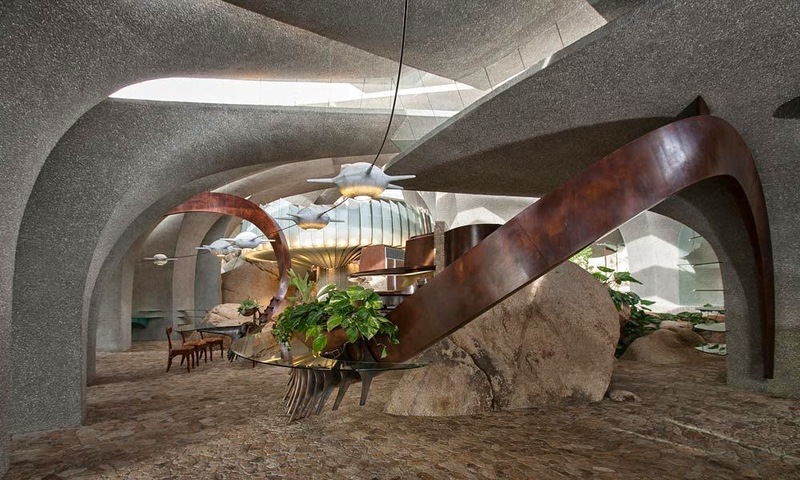 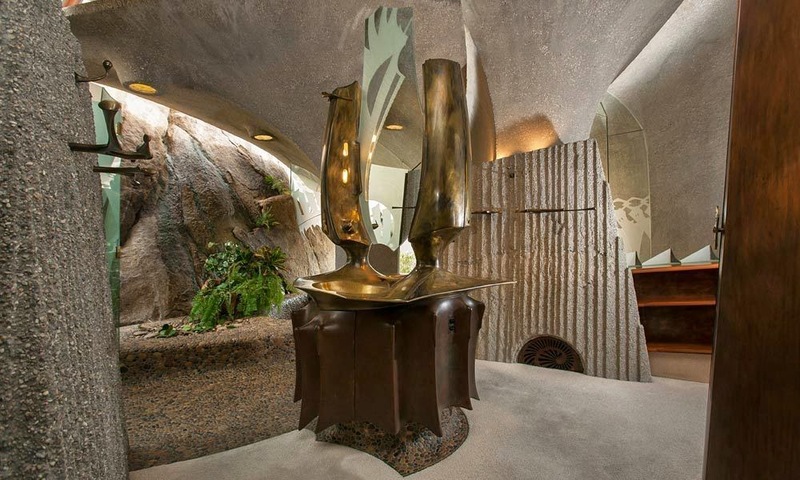 The interior, which took interior designer John Vugrin, years to complete is warm and intimate, with fluid, organic forms that gently embrace the residents as well its natural landscape. 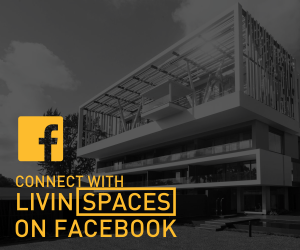 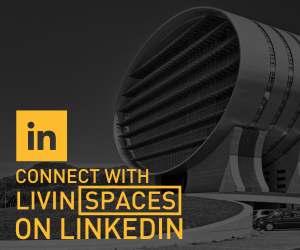 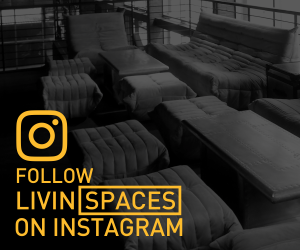 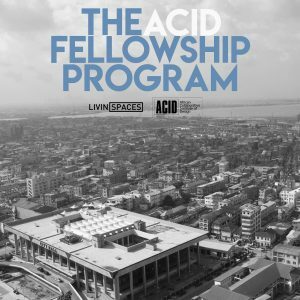 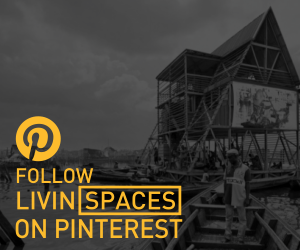 It features a bevy of what look to be custom designed and built furniture and fittings that carry the same edgy and dynamic character of this building. 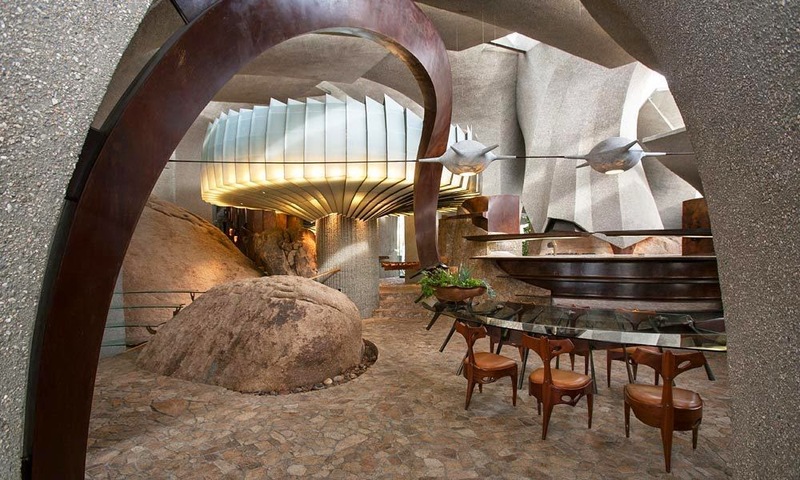 ‘Spiky’ ribbed tables, topped with glass, bespoke cabinetry that hugs the curved spaces, three legged dining chairs, all of which are very imaginative pieces that I doubt you’ll find anywhere else, add that to the strong textures such as the natural rock that features in some spaces and you have a truly authentic desert home. 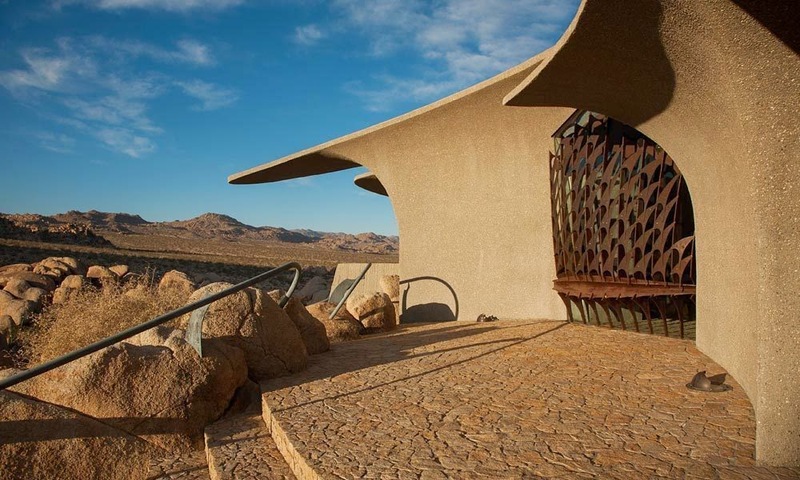 Passive solar design was also adopted when creating the estate, with high level fenestration flooding the spaces with natural daylight and aiding ventilation. 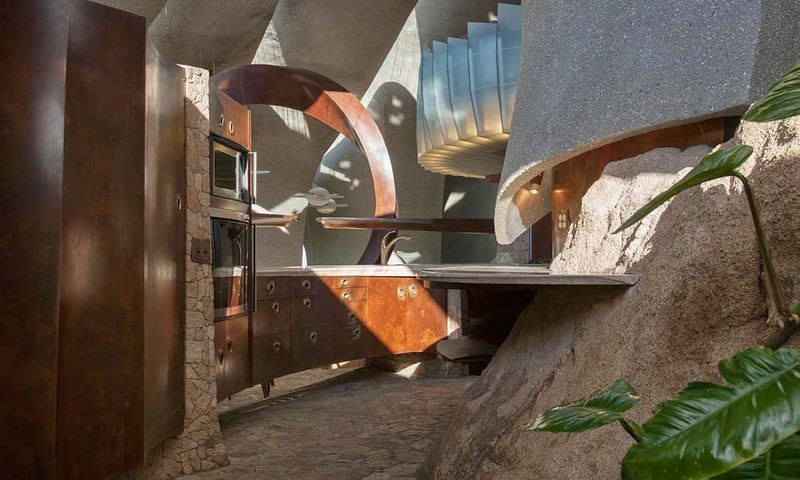 Bold Geometry, sweeping curves, eccentric patterns and forms as well as sensible solar design all work together to deliver, what must be, a great living experience in this little known masterpiece. 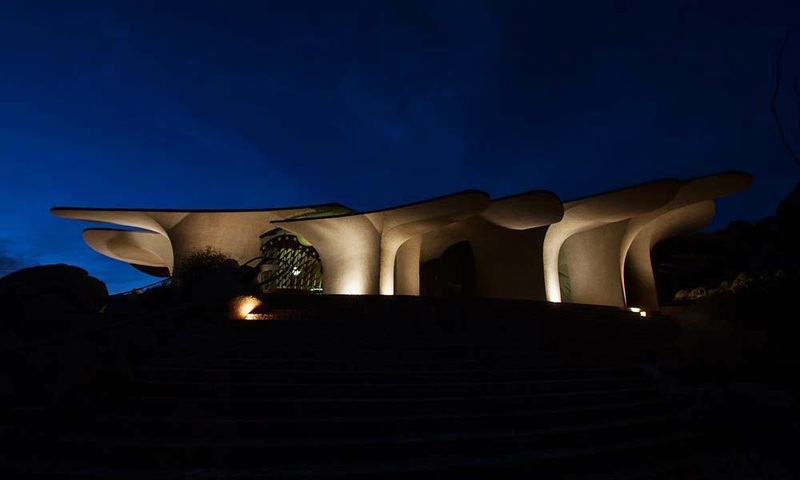 Previous ArticleBlow up Bus-Stop ~ The Inflatable Aarau bus station by Vehovar and Jauslin.